I’m still working on another fumetti, which will feature even more Moes plus a few other characters. Now I’m sorry I never got around to contributing. I’m sorry June. You can be Amurrican if you want. I was just trying to give the whole enterprise a little international flair. I’ll send your cat some socks. Blossom: That’s easy for you to say. You don’t have a doppelganger running around. Dad: Why do the Germans have a special word for it? Is that a big problem over there? I think the third and fifth panel photos should be reversed. Re Doppelgänger on “Blossom”: Germans invent special words by stringing ordinary words together. If yu can translate “double-goer” into meaningful English you’re doing better than I can. I could do another pose, but I sort of need a haircut at the moment. You’ve made my mother a happy woman. June, my condolences. On becoming a Yank, that is. Though you might also welcome condolences once you try to put the socks on your cat. Oh so very funny, thankyou AB. Great look Stacie! The only thing I don’t do, DeLandDeLakes, is teach Women’s Studies. I teach British Lit instead. My girlfriend even looks like Mo and wears striped jumpers. Damn! Now I wish I had submitted a Clarice pose!! Although I guess I could do Janice’s mom better since I don’t have the same hairstyle as Clarice…..Can’t wait to see the Ginger pics! “omen of death”? Shouldn’t that be … “augury of death”? Yow! A dead ringer in profession as well as looks! You truly deserve your fumetti immortality! Isn’t she just the cutest doppelganger you ever saw? Loving Mo’s cat as well. Please dress like this for my visit Stacie! would love to see a photo of you and Stacie together! Stacie, no other pose necessary…that’s wonderfully Sydney! I’ll be seeing her in about ten days and I’m sure she’ll be up for that! May I be a pedant for just a moment? This connects squarely with my mission to educate people about the PANINO/PANINI and BISCOTTO/BISCOTTI distinction. I, and all other Italian-speakers, thank you for learning this teensy bit of Italian grammar. I hope you all will understand. I like June aka “Amurrican Moe’s” expression in the final frame– very cartoon like. And I can’t wait to see Stacie and Jessie N’s photo of Sydney and Moe together. I wish I could submit a photo, but as a bald man with a beard, the only character I could approach is Stuart, but as a gay man, I never let my beard nor my hair get that unkempt. Don’t get me wrong, Stuart’s adorable! And Salvo, I appreciate the Italian lesson. Have we already covered the brava/bravo issue? I am a fan of Dykes to watch out for and now that my daughter Stacie has been picked as Sydney I am even more delited with the cartoon. Way to go Stacie. How fun! I both love and resent the idea of the universally applicable cast of Dykes to watch out for. The doppelganger-motive made me want to see the great doppelganger-movie “La double vie de Véronique” (The Double Life of Véronique) again. There it was a doppelganger in France and Poland. I feel kinda dense today. Can someone help me out? The glasses are different in the first and last panels (they’re more oval in the first, have corners in the last). And it certainly looks like the same person (and the same cat!) in the thoid and fifth panels. The resemblance between Sydney and Stacie is fantastic! American Mo is spot on. And don’t you just love the pictorial of Italian Mo? Hah! Love it! Happy New Year to everyone btw. Cheers! The third and fifth panel Moes are perfect! Excellent expression and the cat adds an extra touch. And Stacie makes a superb Sydney! Well done! Evviva! Ho vinto! Well, I never won a contest in my life! That means a lot to me and I’m inclined to think that if this is the first one, there must be a sense.I would like to thank everyone who made it possible, my enlightened Government, its Church …but especially my loved producer, Virginia, who believed in me and in my pussycat from the beginning..
To you, Alison, my gratitude for getting started my 2008 in such a sweet funny way. Like Amélie Poulain’s dwarf, I hope my new T-shirt will have world-wide attitude, destiny and pictures.. Surfeit of Mo’s? I say, the more the merrier! How about we get some more from the “now I wish I had entered” crowd and we have a Parade of Mo’s? I volunteer to photoshop them into a single picture – suggestions for setting/backdrops welcome! Our winners, who are indeed superb, can lead the way – in all their splendor and varied eyeglass frames. The lone Sydney can be introducing them (or seeing them as in a dream or vision?). You mean the Mo the merrier. And as Mo would say,”nyuk.” i agree with iara. And Spike Lee’s movie Mo’Better Blues could take on a new meaning. For the record,there’s another S.H. : Stacie Haines,the author of Sexual Healing,who lives in San Francisco. Salvo, I teach my daughters the correct Italian singular forms all the time. Now when I am cooking pasta, and they want to eat one of the uncooked strands before dinner, they know to ask for a spaghetto. At a restaurant, we encourage the older one to share a raviolo with her sister. And we know how to make darling little Christmas angel decorations by gluing a farfalla to a penna and spray painting the result white. It’s fun! c.e.loveless: ‘double-goer’: someone who goes (around) as a double (of someone). Just a try. Maybe someone can do better – with the German or the English. Feminista: There is also a Stacie Hanes who is a meteorologist somewhere in the American midwest. I like that, because if anyone brings up any sort of incident from my checkered past, not that there are any, I can blame the meteorologist. In Greek there is also a ‘gender pressure’ to which some words are mercilessly subjected. Adjectives are especially vulnerable, given their enslavement to the gender of the noun they modify. For example, a word such as “modern” wandering into Greek, must be prepared to turn into “moderno” “moderna” “modernos” depending on whether it refers to, say, a dress (“forema” – neutral), a chair (“karekla” – feminine), or lapel (“giakas” -male), respectively. Wierd, I started out trying to write a note about how maybe we should not be so pedantic, but now I think I sound even more pedantic. iara: I thoroughly enjoyed your post! I say pedantry and geekery are generally underrated (grin). I agree with you on borrowed words becoming subject to the new language’s rules, and I also realize the biscotto/biscotti and panino/panini battle is largely lost. I must confess, though, that if those words were imported in the singular, and modified with English plurals (biscotto/biscottos?) it would all feel much more logical to me. Ah, language. Word of the Year 2007, i just heard on the steam wireless, is – not surprisingly – sub-prime. This is from some US Society of Lexicographers or thereabouts. Second on their list of favourite neologisms is googleganger – finding someone else on Google with your name. My googleganger is a continence training nurse in Blackpool, so not a lot of overlap there. And then i found this site http://wordie.org/ “like Flickr without the photos”. Pam I: “googleganger” !!! You hit the jackpot! Salvo, You’re apologizing for “starting a linguistic digression?” Why else would we all be here? Whoa! Stacie is pretty much spot on how I imagine Sydney to look like in real life. Not that I spend vast amounts of time wondering what my favourite cartoon characters would look like if they were real, I hasten to add. Jana H., in a fit of idle curiosity, recently did a Google search on Jana H., and who should she find cluttering up her list but Jana H., writer for Bulletin Today, official publication of University of St. Thomas in St. Paul, Minnesota. Not only does Jana H. have the impudence to be using Jana H.’s name, she is using it in a profession (journalism) to which Jana H. herself once aspired but was too lazy and chicken-hearted to pursue. Jana H. is justly proud to follow the noble profession of geographer and cartographer, but as she approaches her half-century she suffers occasional twinges of regret for not following her earlier dream. She therefore trusts that Jana H. is doing the profession proud, thus upholding the honor of her most excellent name. P.S. Your middle name had better not be Claire! Jana’s reply: Hello Jana! My middle name is Lynn, so you’re safe! I actually wrote for the Aquin, the student newspaper, but I graduated this May and now work for the Duluth News Tribune. I had no idea another Jana H. existed, my name is not very common to begin with. We must be the only two in the nation at least. Nice to hear from you! In fact, we are not the only two in the nation. On a subsequent search I found a Jana H. who wrote a book about Tarot cards. During my 25 years as a Neo-pagan I amassed a collection of Tarot cards, and also compiled a list of ideas for an English History Tarot deck. Weird world! Anyone who wants to find my web writings can find most of them by searching Jana C.H. I use it everywhere. Oh no!! My googleganger died!!! I’ve just found her necrology on google. Is this like the writing on the wall? 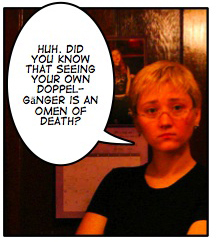 well… should be true what Sydney says in this cartoon: “[…]seeing your doppelgaenger is an omen of death”, the fact that mine is dead could be a long-life omen…for me at least, not for the poor old Violetta B. from Elizabeth City. Rest in peace Violetta! I have no Googleganger. I’m the only Juliet R on the entire web…maybe the entire world. Although I do get 12 mentions, which is kinda satisfying…even if they are geeky academic articles. And yes, I do teach Women’s Studies on occasion. 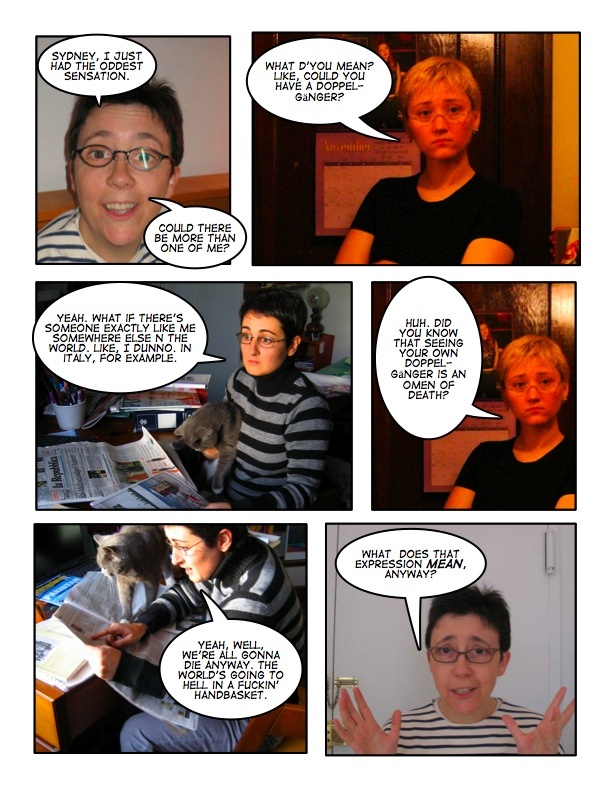 Grazie, Salvo for the fumetto/fumetti, panino/panini, biscotto/biscotti lesson! I speak Italian as well, and although I know “paninis” will never be entirely eradicated from the US vocabulary, I think people are glad to know the distinction between the singular and plural. Here’s a funny story about translating between US English and Italian: I was in Italy with a US friend who does not speak Italian. We were at a café, and she told the waiter she’d like a latte. I asked her if she wanted milk, and she said yes. I asked again, “a latte is just milk, is that what you want?” She said yes again. So the waiter returned with a glass of milk, prompting a puzzled look from my friend. We still get a laugh out of it. Ah, language is fun! Salvo (and all the other linguistic digressors here), do you know the joke about the Latin teacher who goes into a bar and orders a martinus? Bartender says, don’t you mean martini? Latin teacher says, If I want two, I’ll ask for them. Wow. Y’all are awesome. Thank you! I really like the last frame. She totally got an DTWOF facial expression down! It’s a little scary how life imitates art so closely. did i mention that i need a new dtwof teeshirt??? love the linguistic digression too. i love how words get adapted when they’re borrowed into other languages… my favorite is english borrowings into arabic. in arabic, word roots are usually three consonants and you change the vowels to make related words. for example, ‘ktb’ is the root relating to writing, with ‘kataba’ meaning ‘he wrote’, ‘kitaab’ meaning ‘book’, etc. so when english words with three consonants get borrowed into arabic they can be treated like real arabic words, with funny results: ‘bank’ and ‘film’ have both been borrowed into arabic, and their plurals are ‘bunuuk’ and ‘aflam’, respectively. >I’m still working on another fumetti, which will feature even more Moes plus a few other characters. ???? ??????????? ??? ???? ?????????? ?????????????? ???????????????? I went to the health center at my college because of a sore throat, and the nurse thought I was someone else. When she realized I wasn’t that person she said, “Did you know you have a twin at this school? !” I had to stop myself from saying, “Huh. Did you know that seeing your own doppelganger is an omen of death?” I thought it was pretty funny though.